I remember when I saw my first public piano. I came out of the Astor Place subway station in New York City and saw the back of a balding head bent over an upright piano painted with bubblegum camo print. The man was playing an elegant concerto amidst a cacophony of taxis, buses and bikers. When I came back later that evening, I couldn&apos;t see who was at the piano. Around it, a growing crowd of people joined in a bellowing chorus of "Hey, Jude." You couldn&apos;t hear the taxis for the singing. That piano is one of 1,300 like it in 43 cities across the world. They move from city to city for months at a time — sometimes longer — brought by an organization called Play Me, I&apos;m Yours in an effort to build global communities through music. It&apos;s a beautiful idea. Music has the power to bring people together. According to creator Luke Jerram, the pianos are intended to be a "catalyst for conversation," bringing together "invisible communities of people" that share space and may pass each other every day. "[T]he pianos act as a blank canvas for the public to be creative," Jerram told the gbtimes. 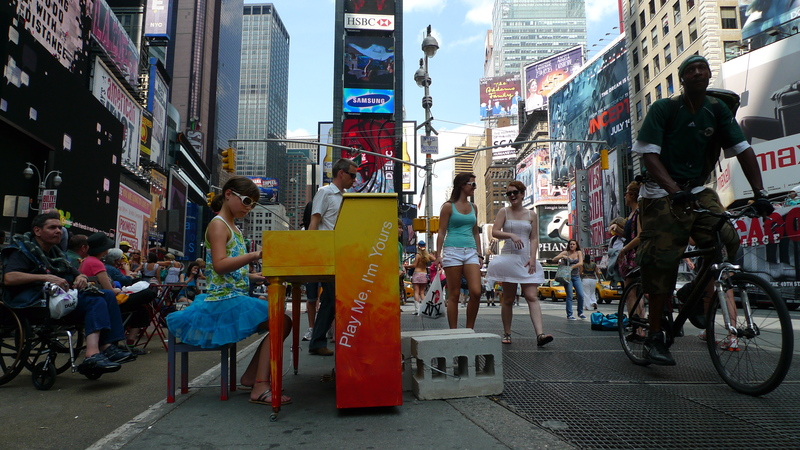 "The pianos are there for the public to express themselves and to transform their own city." Science has proven decisively that music actually does have the power to bring people together and transform public space. Urban geography master&apos;s candidate Vivian Doumpa confirmed through qualitative study that visitors perceived public space to be more welcoming and lively when a jazz group was present. Other scientists have found that music is more efficient than other forms of public art in changing perceptions and emotional experiences of a public space. Market researchers have also found that costumers are more likely to linger in stores and public spaces and feel more positively about them if there&apos;s music playing. But it doesn&apos;t take science to see that, wherever we are, music has the ability to make us feel at home. Here are 13 videos of people across the world, singing at Jarram&apos;s pianos, showing just how powerful music can be. Sao Paulo was one of the first cities to get the pianos. Many there had never seen a piano before, let alone had the chance to play one. Each of the full-size stand-up pianos would have cost about a full year&apos;s wages for a large portion of the population. One piano was set up near the home of a cleaner who had been setting aside a small potion of her earnings each month to pay for her daughter to take piano lessons. She had never heard her daughter play, so when she finally did, the woman burst into tears of joy. Journalists picked up on the story, and the pianos became a massive cultural phenomenon. The public loved the exhibit so much that the piano still stands at the train station today. Puerto Rico has been in dire straits for many years: The population is declining, unemployment is rising and the government currently owes $70 billion. But the government found the money to sponsor the street piano program as a means to help residents engage with urban space in constructive ways and retain hope. Jerram&apos;s pianos didn&apos;t reach NYC until 2010, four years after the program&apos;s start. They appeared all over the city — outside a post office in Jackson Heights, in the Staten Island Zoo, outside the Cathedral Church of Saint John the Divine in Manhattan, on the boardwalk on Coney Island. Sixty pianos in total, the largest installation to date. Musicians normally need permits to play outside, but the project eliminated that hassle. New Yorkers showed up in style to perform and enjoy. Up-and-coming musicians looking for their big breaks used them to create viral videos to promote their acts, like the one included above. Cindy Lauper staged a mini-concert on 42nd Street, decked out in all-black leather suit. It was New York at its best. One of the things Sydney is well-known for is its architectural masterpiece, the Sydney Opera House. The street pianos presented a welcome opportunity to turn that world-class music out onto the streets. During those two weeks, all those who couldn&apos;t afford high-price opera tickets could still enjoy the sense of community that comes from an amazing concert. The following letter from a Sydney man to the "Play Me, I&apos;m Yours" team describes how the music transcended the lines of social class: "One dark raining night in Sydney I went to see if a piano in the park had been covered. Sure enough it had, but there was a homeless man playing piano under the cover in the rain! I wished him well and left him to enjoy his moment." Jerram had conflicts with certain city officials in San Jose who wanted to remove the pianos after their installation. These officials claimed it would promote a general delinquency around the city and would encourage graffiti writers to tag them and surrounding structures. Jerram defended the pianos, reasserting the fact that the creativity and community the pianos create would overshadow any negative effects. The installation went off without a single instance of vandalism. San Jose needed these pianos to prove to officials that public music does not promote delinquency — it promotes community. The pianos came to the Hungarian city of Pécs in 2010 to celebrate the city&apos;s honor of being named European Capital of Culture. People call it the "borderless city" because it enjoys a rich mixture of cultural influences, bringing together European and Middle Eastern culture from neighboring Turkey. City officials couldn&apos;t have come up with a better way to celebrate their "borderlessness" than with weeks of free, open-air, community-building performances on Jerram&apos;s street pianos. Mexico City has been engaged in a massive urban restoration project for the past 14 years to revitalize its city center. Millions of dollars went to repairing crumbling facades, creating jobs and revitalizing tourism. The pianos were the finishing touches to this 14-year battle, and the positive reception the pianos received helped solidify the change in the area as a cultural center once again — they&apos;re what brought the people back to the area. Ever since the SXSW festival was conceived in 1987, Austin has been synonymous with young musical talent. As the festival has grown, however, it has slowly turned increasingly corporate, focused more on promoting brands and established acts rather than helping new ones. The street pianos are a bold grassroots outlet for Austin residents to display their talents. The pianos provided an organic and welcome reminder of the community-building powers of music, which the festival was originally designed to celebrate. The pianos are there to this day, in Austin schools and community groups around the city. Paris is one of the most popular and enduring tourist destinations in the world. It surprisingly continued to attract record numbers throughout the Great Recession when most other European cities were struggling. And when Jerram&apos;s pianos were on display in 2012, they had profound, unforeseen effects. The man who would eventually go on to stage the Ukraine "piano protest," which made a massive viral splash, reminding the world of the healing powers of music, conceived of that idea while enjoying "Play Me, I&apos;m Yours" in Paris. Birmingham, England, was the first city where the pianos appeared. The city council fully supported the project financially, but organizers couldn&apos;t place any pianos on publicly owned land because of a public ordinance from 1753. When the project moved to London in the following year, organizers had to apply for music licenses for each piano. Lord Clement Jones was appalled that something as peaceable and life-affirming as a public piano had to jump through so many legal hurdles to get approved. He brought the issue to the House of Lords, using "Play Me, I&apos;m Yours" as an example of how backward the law was. As a result, musicians no longer need licenses for street pianos in the U.K., and public music can proliferate much more easily. Melbourne had something of a unique opening ceremony when "Play Me, I&apos;m Yours" landed there earlier this year. Before the pianos were distributed around the city, they were gathered together in the Arts Center Melbourne for an epic 24-piano concert. Most cities&apos; installations were rolled out with relatively little fanfare, or the stage was given to quaint amateurs. But Santiago&apos;s pianos were rolled out in style. Leading Chilean artists were hired to paint each of the pianos, and the opening ceremony took the form of a free concert given by one of South America&apos;s most famous concert pianists, Roberto Brazo. The installation lasted for 60 days, more than double most exhibitions. The event was a magnificent exercise in Chilean patriotism that continue to inspire long after the official end of the exhibition. The 20 pianos were taken on a mini tour north to Copiapo, with seven landing in Concepción and four finding homes in La Serena. The pianos are now active in Peru through May 10, hosted by the Mall Aventura Plaza Bellavista in its continuing efforts to revitalize and transform public space. Free music lessons are being hosted at many of the pianos to transmit the gift of music to Peruvians. What they learn will allow them to communicate across borders and cultures because pianos speak the same language — no matter where they appear.